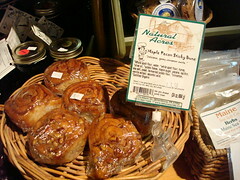 (Cakespy Note: Our suggestion would be to visit the market between Wednesday and Saturday; many of the Amish and Mennonite vendors are not open Sunday through Tuesday). AJ Pickle Patch & Salads: AJ Pickle Patch & Salads is an oasis of deli salads and specialties, but what caught our attention were the glistening rows of puddings and cobblers, all available by the container: the hardest part is deciding whether we'd like to go for banana, key lime, or raspberry pudding--or perhaps a cobbler. Open Wed.-Sat; (215) 627-8067. 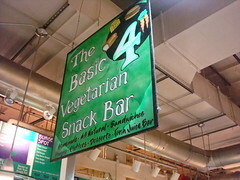 Basic Four Vegetarian Snack Bar: Basic Four looks like a great stop for a veggie or vegan lunch, and a small but respectable offering of desserts, including muffins, breads, and specials such as the sweet potato pie they had the day we visited. 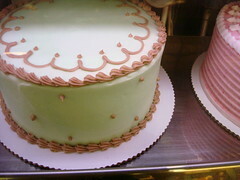 Open seven days; (215) 440-0991. 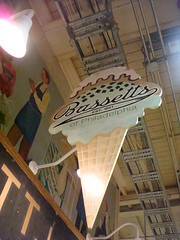 Bassett's Ice Cream: One of the oldest vendors in the market, they've been in the same spot since 1893--and clearly they're doing something right, with creamy, melt-in-your mouth flavors like cinnamon (perfect with apple pie), Butterscotch Vanilla or delightfully boozy Rum Raisin--or, if dairy isn't your thing, try the pinkies-out Champagne sorbet. 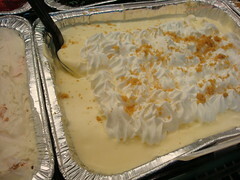 Open seven days, (215) 925-4315; online at bassettsicecream.com. 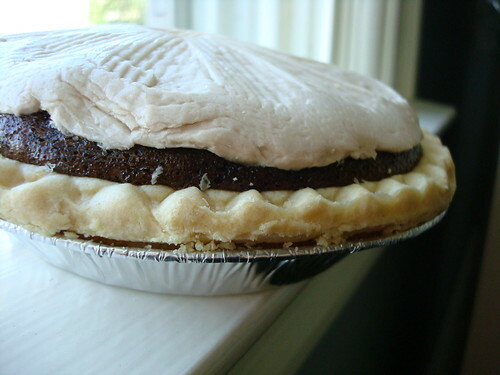 Beiler's Bakery: Though we have some issues with their presentation (in an effort to make their goods easy to take on the go, many items are unattractively plastic-wrapped), overall this is one of our favorites in the Market, featuring Pennsylvania Dutch specialties like whoopie pies, strudels, and pies, including our favorite, the Shoofly Pie, which comes in chocolate as well as the classic molasses flavor. Open Wed.-Sat. ; (215) 351-0735. Chocolate By Mueller: A gorgeous chocolate counter which we found delightfully unpretentious--more like, say, Li-Lac in New York City than a Godiva or fancier (read: expensive) chocolatier. 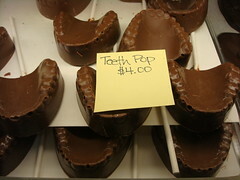 Sensationalist items like chocolate-covered onions and denture-shaped chocolates round out their display. 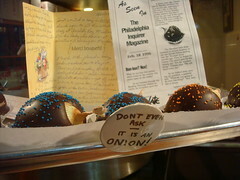 Open seven days, (215) 922-6164; chocolatebymueller.com. Dutch Eating Place: This lunch counter boasts the comfort foods that make Pennsylvania Dutch Country famous--but what is most interesting to us is the apple dumplings, covered in a thick pastry dough and perfect warm with ice cream. 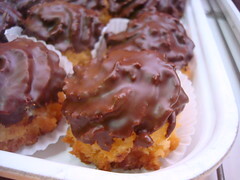 Unfortunately, while they're available to-go as well, some of the magic fades away when the delicate pastries crack on top, so travel with care if you go down that road. 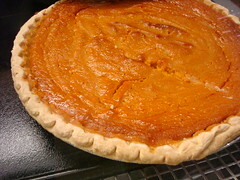 Open Wed.-Sat..; (215) 922-0425. 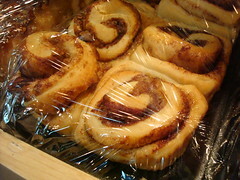 Fair Food Farmstand: Though the emphasis is on fair-trade produce and whole foods, they do have a small sampling of sweets, including all-natural sticky buns and organic jams. Good for a quick fix. (215) 627-2029. 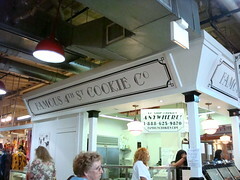 Famous 4th Street Cookie Co.: Cookies, cookies, cookies! We could smell this place before we saw it, and the anticipation is warranted--especially when the cookies are just out of the oven. 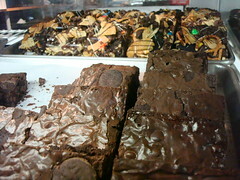 Open seven days, (215) 629-5990; online at famouscookies.com. Fisher's Soft Pretzels: We love New York hot pretzels, but we'd be lying if we didn't say that in a streetfight, Fisher's Soft Pretzels might come out on top. Wonderful. Open Wed.-Sat. ; (215) 592-8510. 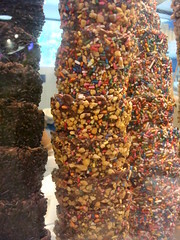 Flying Monkey Patisserie: Definitely the cool kid on the block, Flying Monkey is a delight for the eyes as well as the tastebuds, with rows of happy cupcakes frosted in pastel hues, gooey brownies coated with decadent toppings, and "forbidden cereal treats"--aka the Rice Krispies treats mom never made (and you know we're into that). 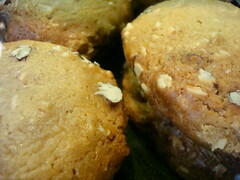 As a nod to New Zealand, we also became acquainted with the Anzac biscuit here. Open seven days, (215) 928-0340; online at flyingmonkeyphilly.com. Hershel's East Side Deli: A classic Jewish Deli, the crowds clamor for the pastrami and comfort foods--but our eyes were glued on the Jewish Apple Cake. 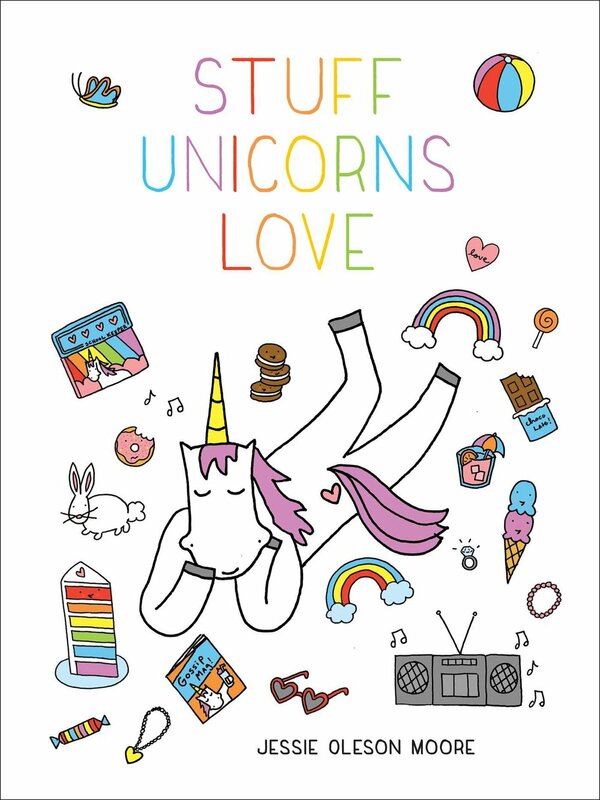 We didn't try it--can any readers pass on feedback? Open seven days; (215) 922-6220. 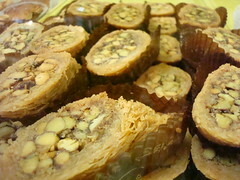 Kamal's Middle Eastern Specialties: A few spots boasted baklava, but theirs was by far and away the nicest display, featuring baklava with various fillings, as well as Konofah, Kataifi and a variety of other Middle Eastern sweets. Open seven days; (215) 925-1511. 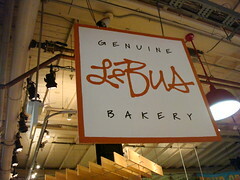 Le Bus Bakery: We found Le Bus to be a good breakfast-bakery--chock full of carbohydrate-rich treats like muffins, scones, and dense artisan breads. They're a bread supplier to many of the nicer restaurants in the area. 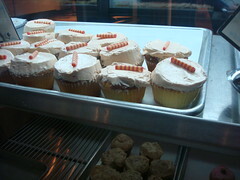 Open seven days, (215) 592-0422; online at lebusbakery.com. 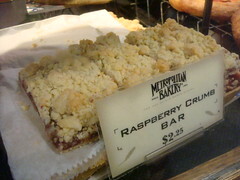 Metropolitan Bakery: A nice mix of homey and fancy, with chocolate croissants living side by side with raspberry crumb bars, cookies, scones and cakes. Everything we tried was wonderful--it seemed like everything had a little something unexpected, some extra spice or garnish to make it just slightly more delicious. 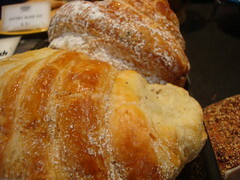 Open seven days, (215) 829-9020; online at metropolitanbakery.com. 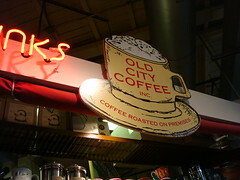 Old City Coffee, Inc.: Coming from Seattle, Old City's dark coffee brews were up to snuff--none of that watered down swill that passes for coffee in so many East Coast coffee places. 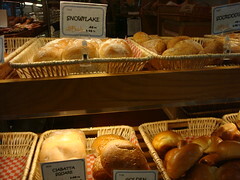 They also had a small but nice array of quick breads and cookies--many of which were made on site. 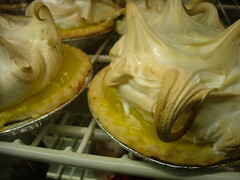 Open seven days, (215) 592-1897; online at oldcitycoffee.com. 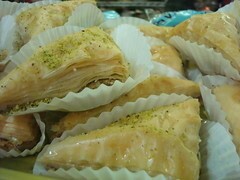 Spice Terminal: Not a bakery, but a great spot to pick up sweet accessories, spices, and garnishes. 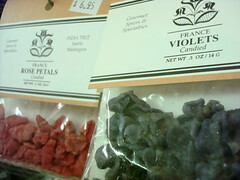 After ogling over their wares for twenty minutes, we finally settled on candied violets and rose petals--a perfect and elegant topping for our next cake. Open seven days; (215) 592-8555. Termini Bros. Bakery: As you have probably gathered by our recent post about the Ravioli pastry, we're pretty much in love with Termini Bros. Bakery--completely old school (they've been around since the twenties), and full of classic Italian delights like cannoli and butter cookies, but also more American-homestyle treats like brightly frosted cupcakes and layer cakes, as well as the unexpected--but intriguing--chocolate covered bananas. 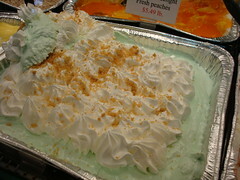 Open seven days, (215) 629-1790; online at termini.com. 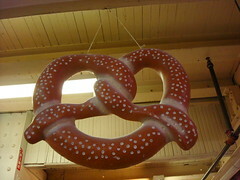 For more information on the Reading Terminal Market, visit readingterminalmarket.org.